As most of this final day broke little more dramatic news than Dimitar Berbatov’s fitting farewell from Fulham for sunny Monaco, it left this January’s dominant news as it was last week, at another of Berbatov’s former clubs, Manchester United. 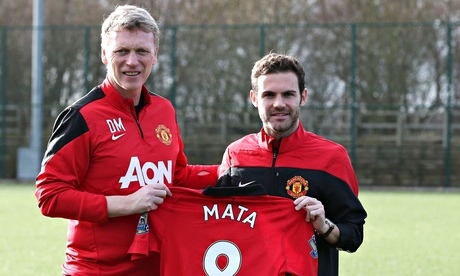 When the flurry of deals have cleared at clubs like Cardiff City, securing Wilfried Zaha on loan as a last-day grasp at avoiding relegation, or Queens Park Rangers borrowing Kevin Doyle from Wolves to bolster the chance of promotion, United’s £37.1m signing of Juan Mata will remain a solid act of football history. Under Sir Alex Ferguson United were the model of January restraint, solemnly resisting the risk of paying a premium and displaying nerves about the season’s closing months. David Moyes tried to show the same “don’t panic” face to January this time, before he broke the club’s transfer record bringing Mata to Old Trafford. That deal revealed where United have suddenly recognised they are, with a squad gradually depleted, while compensated by Ferguson’s managerial mastery, in the years the Glazers drained £680m out to service their own bankers,. The Glazers’ representatives have always said United had cash amassed to spend despite the fortune taken out and that Ferguson had reached his own view that the modern transfer market was overpriced. Whatever it was which caused United to make no top-class signing after £30.75m Berbatov himself in 2008, until Ferguson signed Robin van Persie four years later, the Mata signing demonstrates the approach has changed. United have emerged from the tightest and most financially wasteful days of the early Glazer years with a mountain of cash, and now see that for every reason, football and financial, they must be prepared to spend it on good players. Whether Moyes and Ed Woodward, the executive now signing the deals, have the wherewithal to rebuild United remains unproven by this one January purchase. The accounts (Man City) showed a £52m loss, after £98m in 2011-12, the two accounting years in which Uefa’s financial fair play rules seek to limit total losses to €45m (£37m), less than a quarter of City’s. The fact City were even talking about potentially spending another £35m, on 31 January, on two more players, Eliaquim Mangala and Fernando from Porto, demonstrated the City regime’s confidence they will sail on through Uefa’s scrutiny. City are basing that belief on the exemption Uefa agreed with the top clubs, that they can discount from their loss figure the wages of players under contracts signed before 2010, when the rules were approved. Uefa will examine the books of all clubs closely and City’s Etihad and other Abu Dhabi company sponsorships which must be for “fair value” if related to a club. There is also City’s £47m income from “intellectual property” recorded this year, presumed to be branding, which included £22m sold to City’s own new women’s and New York teams. …The Russian oligarch Roman Abramovich’s Chelsea expressed serious ambitions to rival City for the Premier League title while appearing to take financial fair play respectfully after their years of extravagance. Chelsea spent £42.5m in January signing Nemanja Matic from Benfica, Mohamed Salah from Basel under the nose of Liverpool who disappointed their supporters again, and Kurt Zouma, £12.5m from St Etienne, a somehow quiet acquisition on deadline day. Yet Chelsea actually spun a profit in January, from selling Kevin De Bruyne to Wolfsburg for a reported £17m, as well as Mata. Apart from Chelsea’s buying and selling and United’s departure from tradition, this was a generally restrained January, partly showing how Premier League clubs are trying to be financially more responsible and partly a reminder that fortunes were spent in the summer. Let’s just get used to this selling and transferring, because that’s the reality. Football is not all about the games it’s all about money too.